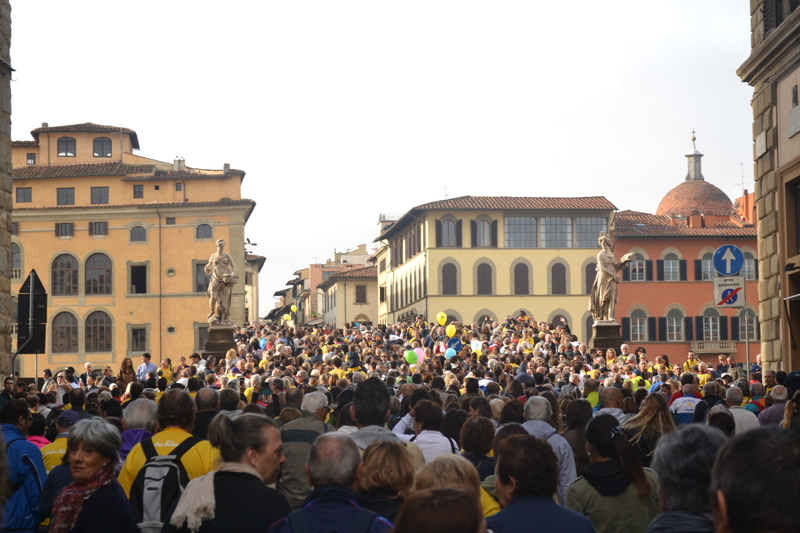 The Corri la Vita is a big Florentine event with thousands of participations. This year the official website calculates the 30,000 people either ran the 14k or walked the 5k, donating €430,000 in support of breast cancer research. Apparently it’s a new record for this organization. The race t-shirts were designed by Feraggamo this year, so I get to say that I own something of his now, even though it was only €10 and 30,000 some people have the same one. It’s the thought that counts, no? Anyway, the race started at 9:15 for runners and walkers alike, so my school organized everyone to arrive at 9:00 in Piazza della Repubblica to walk over to the Duomo together. A few students decided to give the run a shot, and power to them because from what I understand, that sucker was uphill for almost the entirety of the 14 kilometers. I’d have given up and died on the side of the road long before reaching the top. I took the more leisurely route of the walk, which weaved through the city proper, over the river, and into the famed Boboli Gardens of Palazzo Pitti. Given the number of people, it was obviously slow going, so slow that I could read a book and safely navigate my way with the rest of the crowd. The bottleneck that was the Boboli Gardens entrance had us at a stand-still for nearly 20 minutes. Luckily, the route we took featured a number of museums offering free entrance for the day, so there was plenty to see if one didn’t want to be surrounded by people at all times. To get a sense of what it was like, here’s a photo! So that was something of an experience. I managed to finally get home around 12:30, the walk having taken the better part of two-and-a-half hours to complete in its entirety. Many people splintered off after the Boboli Gardens, no doubt heading home or to grab lunch with the friends who’d accompanied them. The students were also eager to get back to studying for their midterms, which are currently underway. That’s definitely not something I envy. I’d be pleased to never have another exam ever. Papers and dissertations, though? Bring it on. My way home, despite the wetness of impending rain, did have a rather nice surprise for me in the form of this gorgeous piece of art here. I’ll be taking this street to and from work now, just to have a look at it twice a day!